Kangchenjunga Conservation Area (KCA) lies in the far eastern region of Nepal. It is home to Mt. Kangchenjunga, the third highest mountain in the world, and also to the majestic snow leopard. Unfortunately, snow leopards face and have faced several very severe threats, especially retaliatory killing by herders, and is listed as an Endangered species in the IUCN Red List of Threatened Species. In order to protect the snow leopards in Nepal, WWF Nepal initiated a community-led conservation program through the establishment of Snow Leopard Conservation Committees (SLCC). The SLCC in Ghunsa, Kangchenjunga was established in 2005 with 7 members. Currently, there are 8 members that are a part of the SLCC. It was established in order to promote conservation in the communities, to reduce human wildlife conflict, and to improve livelihood opportunities for the local people. The members of the SLCC are known as citizen scientists. The members go through a two-month training course provided by WWF Nepal through which they gain the understanding and skills in conservation and snow leopard protection. 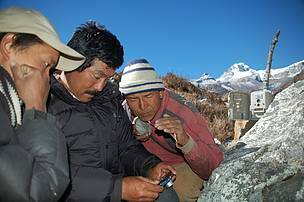 The citizen scientists are, in effect, WWF Nepal’s on-the-ground partners in species monitoring and protection and community mobilization. Prior to 2011, snow leopard monitoring was done through transect studies by the SLCC where pug marks and feces of snow leopards were studied in order to estimate snow leopard populations. In 2011, WWF Nepal introduced camera traps in Kangchenjunga for the first time to help SLCC-Ghunsa better monitor snow leopards. So far, 30 camera traps have been installed in Kangchenjunga with the help of the SLCC to monitor snow leopard population as well as snow leopard movements. Since camera traps are set up in harsh terrain throughout Kangchenjunga, the SLCC members who are deployed to set up and monitor camera traps are paid a minimum wage for their work and this money comes from an endowment fund for snow leopard monitoring. There is also a life insurance scheme that the members of the SLCC are part of. “Setting up camera traps is a risky affair as we have to brave harsh terrains and weather conditions in the high mountains. The life insurance scheme of Rs. 300,000 has come as a big relief to our families,” says Chungda. Reducing human wildlife conflict is another key task of the SLCC. Before the establishment of the SLCC, there used to be a lot of retaliatory killing of snow leopards by the villagers as a form of revenge for their livestock, primarily yaks, that had fallen prey to snow leopards. With snow leopards being viewed as the enemy, the local people had developed negative attitudes towards this species that was robbing them of their livelihoods. The SLCC was therefore tasked with the dual responsibility of changing this attitude as well as providing quick relief to villagers who had been affected. As an immediate measure, the SLCC set up a livestock insurance scheme with the support of WWF Nepal, to compensate affected households for the loss of their livestock on account of snow leopards. Under this scheme, the SLCC established a verification process to ascertain whether the livestock was actually killed by a snow leopard based on a formal request from the affected household followed by disbursement of the insurance money once the verification was completed. The SLCC is presently managing a total fund of USD 16,000 under the livestock insurance scheme and has helped compensate for the loss of 200 yaks so far in Kangchenjunga thereby serving as an important measure in reducing human-wildlife conflict. Besides the livestock insurance scheme, the SLCC has also initiated added measures to reduce human-wildlife conflict such as the use of ‘proof corals’ and the introduction of a guarding system. Proof corals are walls that are 8 feet in height and made of boulders to protect yaks that are under 2 years of age. The proof corals serve as a natural barrier to snow leopards in effect. Similarly, under the guarding system, members of the SLCC as all as the local people take turns in guarding yaks while they are left to graze so that they do not wander off and become prey to snow leopards. Besides the local-level interventions, many trans-boundary programs have also been conducted to protect snow leopards. “India and Nepal have signed a memorandum to work together in snow leopard conservation. Similarly, Nepal and China have participated in many coordination meetings to work together in minimizing illegal wildlife trade and curbing wildlife crimes in order to strengthen snow leopard protection efforts,” says Chungda. Despite the growth in capacity of the SLCC in leading the snow leopard conservation program in Kangchenjunga, there are still challenges that need to be addressed. “We have heard that there are other SLCCs in Nepal such as the ones in Langtang and Dolpa . I think it would be a great idea and very beneficial to us if we could go and visit the SLCCs around Nepal so that we could learn how the SLCCs function and try to incorporate their success into our SLCC in Kangchenjunga,” says Chungda. “Although there has been a decrease in retaliatory killings since the establishment of the SLCC, putting a complete stop to human-wildlife conflict is a big challenge. People are still known to kill snow leopards when their yak is killed. The people of Ghunsa are very poor and yaks form their main source of livelihood and such acts of retaliation are but a natural reflex. We therefore need to scale up the present conflict mitigation measures as well as explore new ones. ” says Chungda. Another major challenge is sustainability. While the dedication and commitment of the present members is highly commendable, it is equally important that the SLCC starts preparing the next in line of members in order to give continuity to its operations. This requires a focus on transferring skills and knowledge as well as finding added sources of funds. At the same time, these challenges do not undermine hope; they in fact create new opportunities. By working with the SLCC and the local communities, WWF Nepal seeks to further empower the local people and strengthen their commitment to live in harmony with nature.